For the green sauce in Mexican cooking, see Salsa verde. Green sauce is a family of cold, uncooked sauces based on herbs, including the Spanish and Italian salsa verde, the French sauce verte, the German Grüne Soße or Frankfurter Grie Soß (Frankfurt dialect), and the Argentinian chimichurri. The Mexican salsa verde, though also called a "green sauce", is instead based on tomatillos; the New Mexico version uses a green chile base. The basic recipe is probably from the Near East and, as such, is probably at least 2,000 years old. Roman legionaries brought it to Italy, from where it was exported to France and Germany. Evidence suggests that it was introduced in Frankfurt by the Italian trading families Bolongaro and Crevenna around 1700. 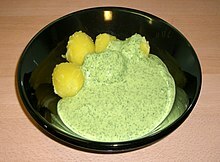 Grüne Soße is a specialty of the German state of Hesse. Centres of popularity are the cities of Frankfurt am Main (where it is sometimes called "Grie Soß") and Kassel, which lay claim to its origins. The Frankfurt-style is made exclusively from seven fresh herbs, namely parsley, chives, chervil, borage, sorrel, garden cress, and salad burnet together with sour cream, oil, vinegar, mustard, salt and added hard boiled eggs. Variants of other local areas, often due to seasonal availability, include dill, shallots, lovage, lemon balm, and even spinach. In more frugal times, daisy leaves, broad plantain leaves, and dandelion leaves were also used. 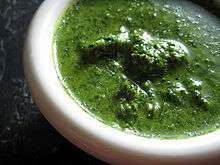 Green goddess is a green sauce used as a salad dressing. Based on the French sauce verte, it is also made with tarragon, parsley, mayonnaise, sour cream, and lemon juice, but also includes anchovies.